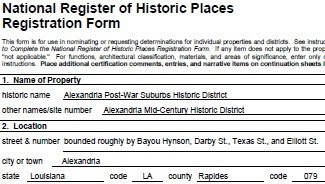 There will be big goings on downtown on May 18-19 when the Louisiana Annual Preservation Conference is hosted in Alexandria at the Hotel Bentley. This is an annual event which brings preservationists from around the state together, and we welcome the event and all attendees to our downtown as well as to our Post-War Suburbs Historic District. On Friday afternoon, May 19, some attendees will be taking self-guided tours of our mid-century modern National Register Historic District. There are 149 homes in the historic district, of which all but 14 are contributing elements. We welcome preservationists to our district and wish you all an enjoyable and safe tour. Please exercise caution, especially on Elliott Street as it is a through street. For tour information, select this link or the Tours tab. For conference information, click on the image.